The Iceland Greylag Goose breeds in Iceland and winters almost elusively in Britain, with smaller numbers in Ireland, Norway and the Faeroe Islands. Increasingly, some birds also remain in Iceland over winter. Early analysis of ringing data confirmed that this population of Greylag Goose was discrete from others in the Western Palearctic, including the British-breeding population. Nowadays, however, there is some overlap between the Icelandic and British birds during the winter, notably in Orkney and Caithness. Annual estimates of the population size, percentage of young (%) and mean brood size (young per successful pair) of Iceland Greylag Goose, 2003-2015. Data are collected through the Icelandic-breeding Goose Census. Crowe, O. & C. Holt. 2013. 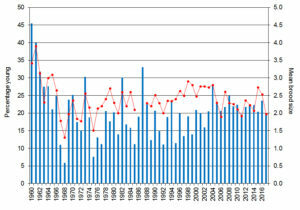 Estimates of waterbird numbers wintering in Ireland, 2006/07-2010/11. Irish Birds 9: 545-552. The Iceland population of the Greylag Goose was confirmed as being discrete from other Greylag Goose populations in the Western Palearctic, including the British-breeding population, by early analyses of ringing data. There is, however, some overlap between these populations during the winter, notably in Orkney and Caithness. This population breeds in lowland areas of Iceland. Each autumn, birds migrate to spend the winter almost exclusively in Britain. A small number of birds also winter in Ireland and the Faeroe Islands, and others have recently been identified in southern Norway. Arrival in Britain begins in early autumn, particularly in north and east Scotland. Considerable redistribution used to occur later in the winter, especially to traditional haunts further south within Scotland and to northern England. Important changes in these patterns, however, since the 1970s means this rarely happens nowadays; there has been a clear contraction of range northwards and formerly important sites, especially in southern and central Scotland, have now been abandoned. Consequent increases have been most marked on Orkney, where winter numbers have increased from c. 3,000 in the early 1990s to a peak of over 60,000 in 2010 (Mitchell 2011). From early April, birds begin to leave Britain to return to the southern lowlands and other coastal areas of Iceland (Hearn & Mitchell 2004). As little traditional winter habitat (coastal Scirpus beds and inland fens and marshes) remains in Britain today, the species has moved inland to feed on arable farmland and improved pastures. Many of these crops are of economic value and this has brought the geese into direct conflict with farmers. Farmers have tolerated geese for many years, but concern and the number of complaints have been growing, particularly where goose numbers are high and increasing, such as Orkney. Hearn, R.D. & C.R. Mitchell. 2004. 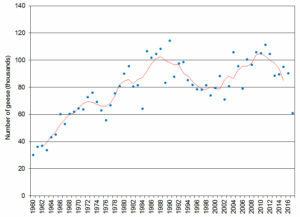 Greylag Goose Anser anser (Iceland population) in Britain and Ireland 1960/61 – 1999/2000. Waterbird Review Series, The Wildfowl & Wetlands Trust/Joint Nature Conservation Committee, Slimbridge. Mitchell, C. 2011. Status and distribution of Icelandic-breeding geese: results of the 2010 international census. Wildfowl & Wetlands Trust Report, Slimbridge. The Iceland Greylag Goose population is monitored through the Icelandic-breeding Goose Census; an international census undertaken in Britain, Ireland, Iceland, Norway and the Faeroe Islands. The census is undertaken annually and involves coordinated counts carried out in autumn and early winter. Results from the census are presented in various reports which can be downloaded from the Reports & newsletter page. The annual breeding success of the Iceland Greylag Goose population is monitored through age assessments that are undertaken annually throughout the autumn and early winter. Counters record the number of first winter birds present within a flock and individual brood sizes (i.e. how many young in each family group). Results from these age assessments are presented on the ‘Latest results’ tab, and a summary table can also be found on the ‘Status summary’ tab. The 58th consecutive Icelandic-breeding Goose Census (IGC) took place during late autumn 2017, providing information on the abundance and distribution of Iceland Greylag Geese. A full account of the census can be found in Brides et al. (2018). Counts were conducted by a network of volunteer observers and professional conservation staff over the weekend of 18/19 November with an additional spring census being carried out on 10/11 March (see Brides et al. (2018) for results of the latter). Coverage in Britain was average, with 106 sites checked (compared with 102 sites checked in 2016). Outside of Britain, counts were made at several sites in Iceland and southwest Norway. Counts in Norway took place in January rather than November, and the total from these counts was used as an estimated count for the November period, since guidance from local counters in Southwest Norway suggests that the winter influx of Iceland migrants occurs in Late October or early November and they remain there throughout the winter (A Follestad pers comm.). The total count was 89,874 Greylag Geese (Table 1). Following adjustments for the presence of British/Irish Greylag Geese, which is significant in some areas, a population estimate of 60,962 was derived. This represented a decrease of 32.6% compared to 2016 (Figure 1), when a population size of 90,471 individuals was estimated. Table 1. Regional distribution of Iceland Greylag Geese during November 2017 (nc = not counted or no count received). Figure 1. Annual census-derived estimates of Iceland Greylag Goose population size, 1960-2017. Five-year running mean shown as red line (e.g. mean for 2014 is from population estimates for 2012–2016). During mid-November, 1,650 Greylag Geese from ten flocks were aged in Caithness, north Scotland, which represents 2.7% of the 2017 census-derived population estimate. The brood size of 30 families was also determined during this period. Breeding success was lower than in 2016 (23.5%), with flocks containing 19.9% young and slightly lower than the recent mean (mean 2007–2016: 22.1% ± 0.47) (Figure 2). The mean brood size of 1.97 goslings per successful pair was lower than that of the recent ten-year mean (mean 2007–2017: 2.31 ± 0.08). Figure 2. The percentage of young (blue columns) and mean brood size (red circles) of Iceland Greylag Geese, 1960–2017. The population estimate of 61,809 geese is lower than that in 2016 and whilst suggestions of a recent population decline have been given in previous accounts (see species account 2016) it is likely that possible undercounting in some areas may have affected the overall 2017 population estimate and therefore shadowing the true estimate. Greylag Goose remains a favoured quarry species in Iceland, with 30,000 to 60,000 birds shot there annually with 43,376 shot in 2016 (Statistics Iceland 2018) and, as reported in the 2015 Icelandic-breeding Goose Census Report (Mitchell 2016), there has been a marked increase in the number of Greylag Geese shot in Orkney to reduce the British Greylag Goose population on the archipelago, and it is therefore likely that more Icelandic geese are being shot there too. Obtaining information on the number of Icelandic geese being shot on Orkney would be very difficult, as it is impossible to differentiate between geese from the two populations. It is also possible that disturbance from shooting could be causing dispersal to new locations that are not being covered by the census. The departure of Greylag Geese from Iceland can be highly changeable from year to year due to the influence of weather conditions. In November 2016, counts identified 50,000 Greylag Geese present in Iceland during the census, which is markedly higher than the total counted there in November 2017. Given that the aerial and ground counts in Iceland were conducted under the most favourable conditions during November 2017, the observers are confident that the results are representative of the number of birds present at the time. Orkney continued to hold the main proportion of birds. 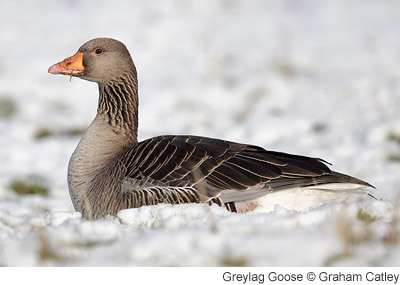 As geese from both the Icelandic and British populations of Greylags are present at the site at the time of the autumn census, an estimated number for the latter is deducted from the census count in order to estimate the number of Icelandic birds. Since no summer survey was undertaken in Orkney during 2017, the total number of birds counted in summer 2016 (21,000 birds) was deducted from the overall November 2017 total, which resulted in an estimated 42,045 Icelandic birds thought to be present. 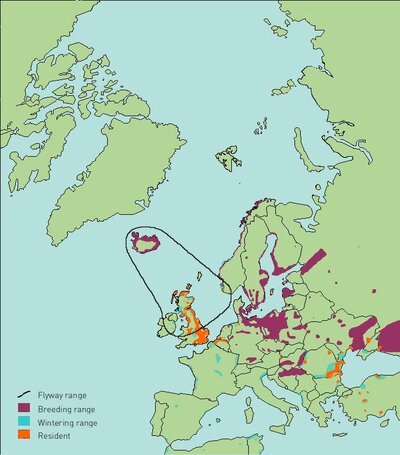 As previously reported, increasing numbers of British/Irish Greylag Geese in core wintering areas for the Icelandic geese, such as Shetland, Orkney, the Moray Firth, Bute and other parts of Scotland and Ireland means that assessing the abundance of the Iceland population remains very difficult. Up to date information on the abundance of British Greylag south and east of an arbitrary line from Bute east to Aberdeen is largely lacking and, therefore, simply as a precaution, any counts obtained through the IGC from this area are subtracted from the overall totals, making the assumption that the majority of birds counted there are British. The percentage of young in those flocks assessed indicated slightly lower breeding success in 2017 than the recent mean for this species (see breeding success above). The monitoring of annual breeding success for this population is becoming more difficult because the main wintering areas (Orkney and around the Moray Firth) hold ever larger numbers of British Greylag Geese and separating birds from each population is impossible in the field. However, the results from summer counts suggest that the bulk of the birds found in Caithness in winter are from Iceland and it is in this county that age counts were undertaken. Many thanks go to the many IGC counters and Local Organisers who provided the basis of the population assessments. Thanks also go to those who contributed age assessment data. Previous annual results will be archived here. Annual Icelandic-breeding Goose Census reports can be found on the Reports & newsletter page. The colour-marking of Iceland Greylag Geese began in earnest in the early 1990s, when Highland Ringing Group (led by Bob Swann), supported by WWT, began to cannon-net birds and mark them with grey neck collars at Loch Eye, near Tain. This provided the first understanding of how Iceland Greylags moved around the wintering grounds. In 1996, WWT and the Icelandic Institute of Natural History began a five year marking programme, capturing around 1,000 birds (moulting adults and goslings) at breeding and moulting sites in Iceland. Other British ringing groups also contributed to the capture and marking at this time, most notably the Grampian Ringing Group. This collective effort resulted in a large dataset of re-encounters of marked birds, and a number of papers were published using this information, including analyses of winter movements (Swann et al. 2005), and survival rates (Frederiksen et al. 2004). More recently, fewer birds have been marked; but targeted marking of small numbers continues to take place in Ireland by Alan Lauder and several small catches on Islay, north west Scotland and on the breeding grounds in Iceland. Much of this work is focussed on questions about the status of Greylags in certain parts of Scotland and Ireland, where there is increasing overlap in winter range between British Greylag Geese and Icelandic birds, making monitoring more difficult. Sightings of marked birds are still sought from birdwatchers. If you see a colour marked bird, please submit your sighting to colourmarkedwildfowl@wwt.org.uk. Frederiksen, M., R.D. Hearn, C. Mitchell, A.Þ. Sigfússon, R.L. Swann & A.D. Fox. 2004. The size and dynamics of Icelandic-breeding goose populations: a reassessment of the evidence. Journal of Applied Ecology 41: 315-334. Hunting in Iceland: The numbers of Greylag Geese hunted in Iceland are available here.